Many thanks to all who have made our seasons so successful. Each and every person who comes into contact with our group, in any capacity, contributes to that success. As you know, it takes a great deal of time, hard work and money to operate any non-profit organization and keep it running successfully. We have been fortunate, with your help, to continue to operate very efficiently, staying within our budget and still provide the community with outstanding, quality entertainment, especially in the current economic climate. We are very proud of the work we do and are grateful to those who give of their time and money to the group. The costs of running a theater company continue to escalate; rental costs for performance venues, rental of storage space for inventory, increased productions costs, etc. Ticket revenue does not cover all of the operating expenses for our company. 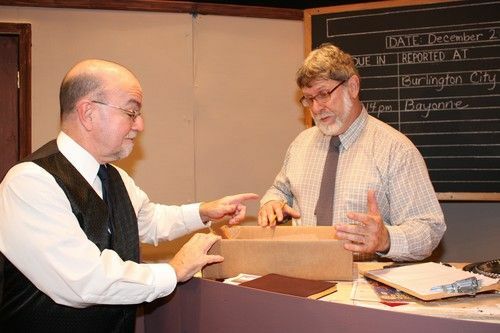 By becoming a Friend of Bridge Players Theatre Company, your generous contribution will allow us to continue to bring great theater to you and our community. Please consider becoming a Friend of Bridge Players Theatre Company. Any support you can give us is greatly appreciated. Thank you in advance for your support, and we look forward to seeing you for what promises to be a great season! Click below to become a friend of Bridge Players by becoming a member or by donating. Do a little shopping right at the theater and support Bridge Players. Pick up a copy of the Bridge Players cookbook. It's filled with a variety of wonderful recipes that will guarantee you'll receive a standing ovation! Cookbooks are only $10. Cookbooks can be purchased at the theater during the run of our shows.